First things first, I have to apologize for not posting up a Mini of the Week last Friday. It was a bit of poor planning on my part combined with being busy at Adepticon, but now we're back on track! 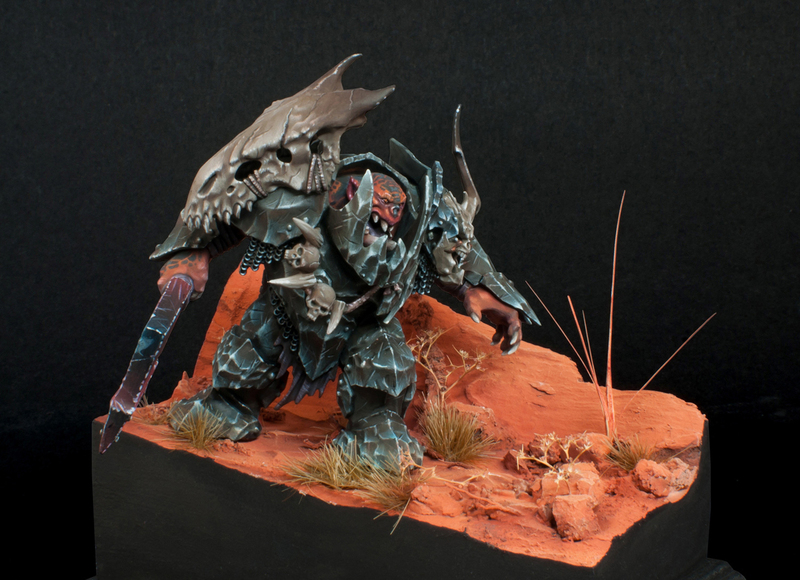 The Megaboss is a favorite amongst painters, and here we see it continue in its trend of awesome paint jobs. 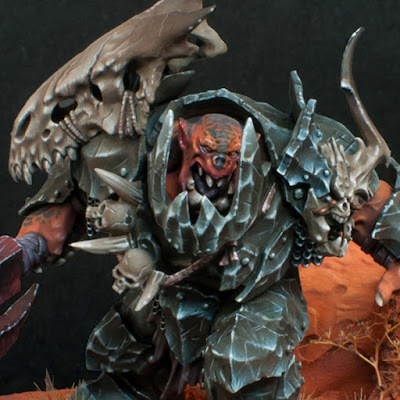 It's not often you see a red orruk, but it definitely looks great. Everything is smooth and crisp, with some great color choices. If you follow the link you can read how he was inspired by David Soper's wonderful rendition of the model, which definitely shows through. It has it's own unique twist on everything though, the red skin being an obvious one. They have gone for a bit more of the spotted look on the skin, making it look more like a pattern than liver spots. The cool blue of the armor also really helps balance out the deep red. I love the display base done on this. The red rocks and sand is something you don't see done often. Usually it's a Mars theme, but this feels right at home in the American Southwest. I can just imagine this orruk's tribe making its home in some pocket of Ghur that looks like this. It helps reinforce the red of the skin, while being a more earthy tone and also a different enough shade that it doesn't just all run together.